Welcome - Please explore our website and check our Facebook page. 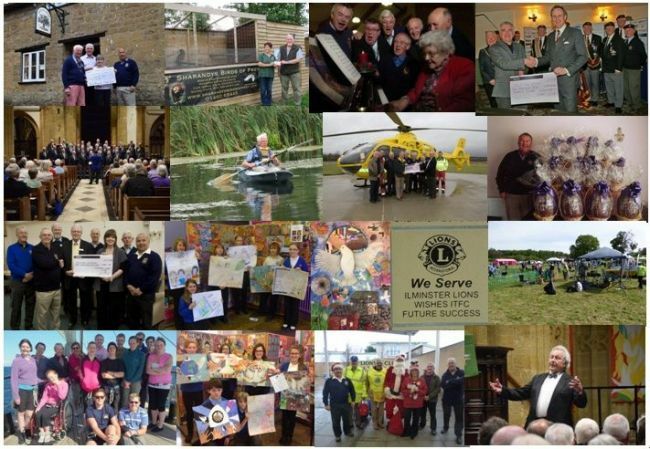 Each year the President of The Lions Club of Ilminster and District can choose a charity to support during his/her term of Office. This year, the Lion President Andrew Lawson has selected The Children’s Hospice Southwest as his nominated charity. Over the last few years, Parkinson's Research, The Beacon Centre, Taunton, The Dorset and Somerset Air Ambulance, and more recently The Neonatal Intensive Care Unit at Musgrove Park Hospital have been among the chosen charities. The donations usually go to buy specific pieces of important equipment in consultation with the charity. 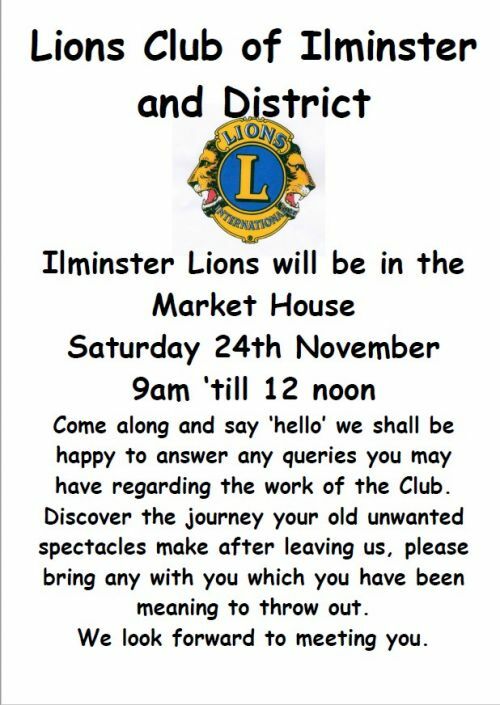 These donatios and the work undertaken by Ilminster Lions could not take place without the generosity and support of our local community. So Ilminster Lions sincerely thank all those who give so generously and would ask for your continued support. Come along and say ‘hello’ we shall be happy to answer any queries you may have regarding the work of the Club. 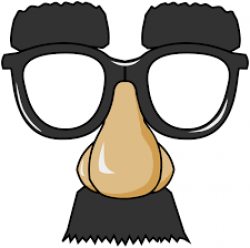 Discover the journey your old unwanted spectacles make after leaving us so please bring any with you which you have been meaning to throw out. Thanks for supporting our Fete which raised £4600, shared with Ilminster Town Football Club. We are also very grateful to all the local businesses who have supported us by advertising in our Fete programmes for so many years. Our 2nd Vice Diict Governor Lion Jim Partridge-Hogbin (right) paid us a visit recently and presented Ilminster Lions President, Andrew Lawson (left), with a bannerette from the District Governor, Lion Ian Snell. 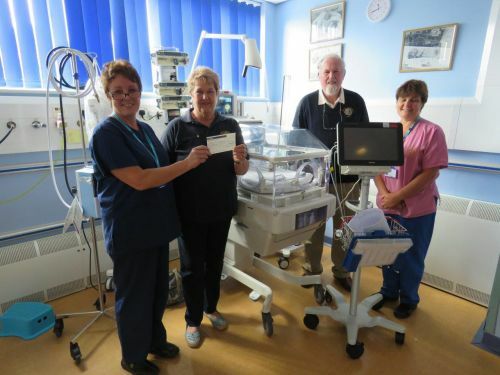 A fascinating visit to Musgrove Park Neonatal Intensive Care Unit culminated with Ilminster Lions Shirley Farley (2nd left) and Nigel Clymow (2nd right) presenting a £500 cheque to Sister Sue Spooner (left) with Nursery Nurse Jane Benton (right). A brief insight into the highly specialised work of the dedicated team at the Unit was much appreciated. The gymnasts at Swanmead needed some new equipment and leotards so Ilminster Lions gave them some help. The Sunny Ile Pre School asked us to help provide some out-door equipment so Ilminster Lions helped out with a cheque for £719. 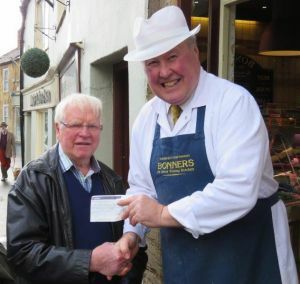 The Lions Club of Ilminster and District President, Alan Rudkin presents a cheque for £3000 to the Chairman of the local branch of Parkinson’s UK, Mr Alan Gould with his wife, Isobel. 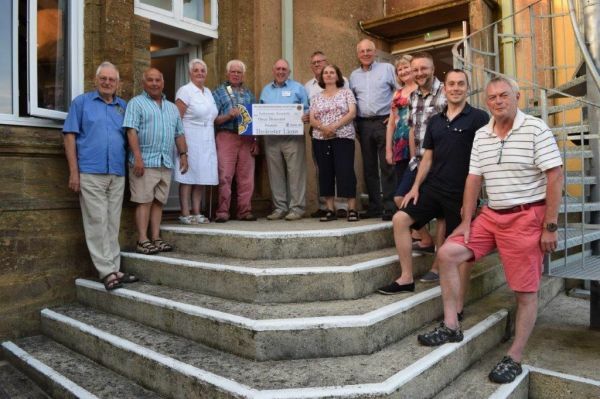 Ilminster Lions thank everyone who helped to raise this sum for such a worthwhile cause. 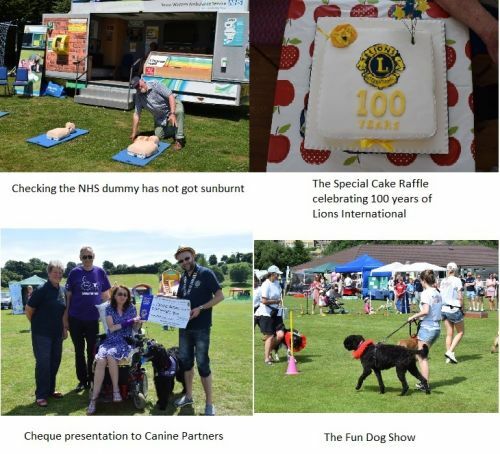 The presentation also coincided with Ilminster Lions Knobbly Knees Contest! 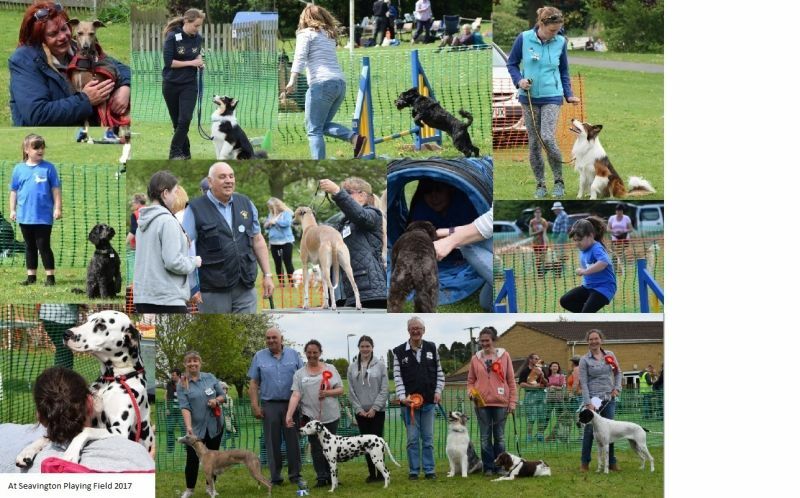 Our Spring Event at Seavington Playing Field, the Kennel Club Obedience rally on Saturday 6th and Dog Show, Craft and Entertainment on Sunday 7th was enjoyed by all especially the dogs! PLEASE CLICK here for details of our Spring Event programme advertisers plus details of all the prizes kindly donated to our raffle! Members of the Lions Club of Ilminster and District enjoyed a tree planting ceremony at Ilminster Football Club on Saturday 1st April 2017. Joined by District Councillor Carol Goodall, Directors of the Football Club and members of the under 6 years team, Lion Alan Gibbs set the Italian Alder, chosen for its suitability for the location, in position next to the Archie Gooch Pavilion. The children were not hoodwinked into believing that spaghetti would bloom on their Italian tree next Spring, even though it was April Fool’s Day. The First South Petherton Rainbows recently received a £200 donation towards their activities, presented by Lions Glenys Whaites, Rosemary Jackson and Shirley Farley. The Ilminster Victorian Evening, taking place in November each year, gives us an opportunity to accept donations for our mulled wine and biscuits. From this we make a donation to the Ilminster Christmas Lights Committee to help towards the cost of providing this spectacular show. Our last remaining Charter Member, Norman 'Dusty' Miller, decided to retire from the Club after giving 40 year's service to the Ilminster community. He held many positions including Club President during that time and was always ready to give his time and expertise to all the club's activities. We will keep in touch with him but will miss his friendliness, humour and kindness at our meetings and events. The President, Alan Rudkin (R), presented Norman (L) with a token of our appreciation at the Christmas dinner in December, 2016. Each December, we organise a party for the children at Greenfylde C of E First School in Ilminster when we provide an entertainer then a few snacks. We can tell they've enjoyed themselves from the decibel level when they shout out 'Abracadabra', 'Hocus Pocus' or even 'Smelly Socks' to make the magic work! This year we welcomed Professor Bumble from Sidmouth with his combination of silliness, magic, juggling, uni-cycling and balloon animals! Top row - Receiving a donation from the Royal Oak, Over Stratton; A donation to birds of prey; A sing-song somewhere; A donation to Help for Heroes. Second row - Concert by Taunton Deane Male Voice Choir at The Minster; President Alan Rudkin looking for the source of the River Ile; A donation to Dorset & Somerset Air Ambulance; Dave Searle and the Easter Eggs. Third row - A donation to Vaughan-Lee House, Ilminster; Peace posters at Swanmead School, Ilminster; A Peace poster winner; Our brick at the new Ilminster Town Football Club Building; The Dog Show & Fete at Dillington.